Google has officially announced Android 4.3 update to existing Android 4.2 Jelly Bean OS at a press event in San Francisco. The new version is not a major version so it is also called in the name of Jelly Bean. Android 4.3 comes with performance optimizations and brings a number of improvements for users and developers. 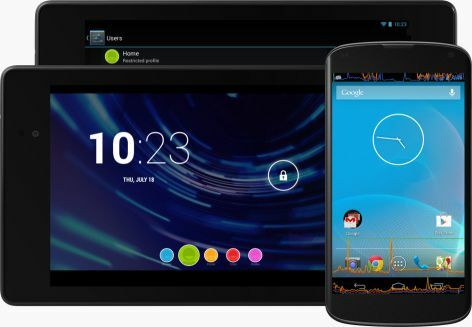 The Android 4.3 update has main highlights including Restricted profiles, Bluetooth 4.0 low energy support, smoother animations, redesigned camera interface, OpenGL ES 3.0 support, dial-pad auto complete and more. 1.Restricted Profiles – This is the multi-user feature in a single device so you can create separate profiles for your kids and family. You can restrict the apps and contents to each one like parental controls. 2. Faster and Smoother – Android 4.3 has the faster performance improvements such as rendering for shapes and text, improved window buffer allocation and more. 3. OpenGL ES 3.0 Support - It provides games and other apps with highest performance 2D and 3D graphics capabilities on supported devices. So you can play games with high-performance graphics. 4. Enhanced Bluetooth Connectivity – Bluetooth Smart or Bluetooth Low Energy feature is the latest standard that allows you to connect the devices like Smart Watches. It will takes less power so you can stay connected for long time without worrying of battery life. 5.Wi-Fi scan only mode – It’s a new feature that lets users keep Wi-Fi scan without connecting to a Wi-Fi network, to improve location accuracy while conserving battery. 6. Dial-pad auto complete –you can easily dial numbers without typing full phone numbers. Auto complete suggests your contacts when you are dialing. Android 4.3 will be available on the New Nexus 7 and it is the first device installed with this new update. And over-the-air update is also available on other Nexus devices such as Nexus 4, Nexus 7, Nexus 10 and Galaxy Nexus. If you have a Nexus phone or tablet, you can update your device to latest Android 4.3 update starting from today.